Known for: Editor of the 19th century's most successful woman's magazine (and the most popular antebulleum magazine in America), setting standards for style and manners while expanding limits for women within their "domestic sphere" roles;. Hale was the literary editor of Godey's Lady's Book and promoted Thanksgiving as a national holiday. She's also credited with writing the children's ditty, "Mary Had a Little Lamb"
Born Sarah Josepha Buell, she was born in Newport, New Hampshire, in 1788. Her father, Captain Buell, had fought in the Revolutionary War; with his wife, Martha Whittlesey, he moved to New Hampshire after the war, and they settled on a farm owned by his grandfather. Sarah was born there, third of her parents' children. Sarah's mother was her first teacher, passing on to her daughter a love of books and a commitment to the basic education of women in order to educate their families. When Sarah's older brother, Horatio, attended Dartmouth, he spent his summers at home tutoring Sarah in the same subjects he was learning: Latin, philosophy, geography, literature and more. Although colleges were not open to women, Sarah gained the equivalent of a college education. She used her education as a teacher in a private school for boys and girls near her home, from 1806 to 1813, at a time when women as teachers were still rare. In October, 1813, Sarah married a young lawyer, David Hale. He continued her education, tutoring her in subjects including French and botany, and they studied and read together in the evenings. He also encouraged her to write for local publication; she later credited his guidance with helping her write more clearly. They had four children, and Sarah was pregnant with their fifth, when David Hale died in 1822 of pneumonia. She wore mourning black the reset of her life in honor of her husband. The young widow, in her mid-30s, left with five children to raise, was without adequate financial means for herself and the children. She wanted to see them educated, and so she sought some means of self-support. David's fellow Masons helped Sarah Hale and her sister-in-law to start a small millinery shop. But they did not do well at this enterprise, and it soon closed. Sarah decided that she would try to earn a living at one of the few vocations available for women: writing. She began submitting her work to magazines and newspapers, and some items were published under the pseudonym "Cordelia." In 1823, again with the support of the Masons, she published a book of poems, The Genius of Oblivion, which enjoyed some success. In 1826, she received a prize for a poem, "Hymn to Charity," in the Boston Spectator and Ladies' Album, for a sum of twenty-five dollars. 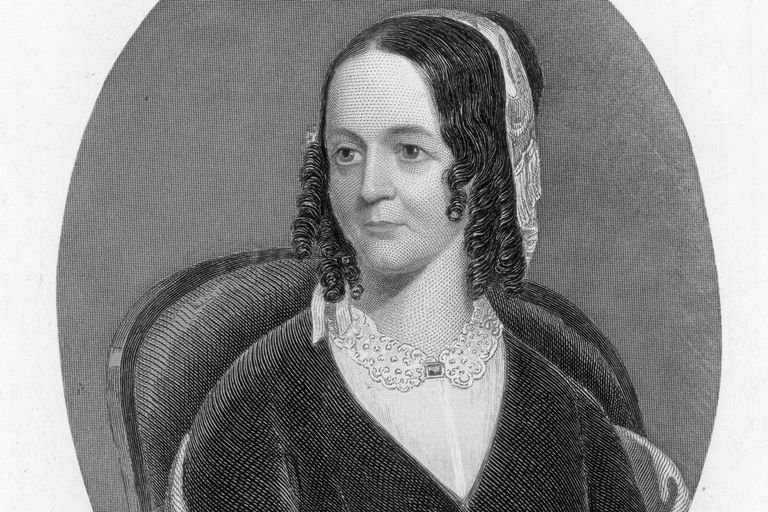 In 1827, Sarah Josepha Hale published her first novel, Northwood, a Tale of New England. The reviews and public reception were positive. The novel depicted home life in the early Republic, contrasting how life was lived in the North and in the South. It touched on the issue of slavery, which Hale later called "a stain on our national character," and on the growing economic tensions between the two regions. The novel supported the idea of freeing the enslaved and returning them to Africa, settling them in Liberia. The depiction of enslavement highlighted the harm to those enslaved, but also the dehumanization of those who enslaved others or were part of the nation that allowed enslavement. Northwood was the first publication of an American novel written by a woman. The novel caught the eye of an Episcopal minister, the Rev. John Lauris Blake. The Rev. Blake was starting a new women's magazine out of Boston. There had been about 20 American magazines or newspapers directed at women, but none had enjoyed any real success. Blake hired Sarah Josepha Hale as editor of Ladies' Magazine. She moved to Boston, bringing her youngest son with her, The older children were sent to live with relatives or sent to school. The boarding-house in which she stayed also housed Oliver Wendell Holmes. She became friends with much of the Boston-area literary community, including the Peabody sisters. The magazine was billed at the time as "the first magazine edited by a woman for women ... either in the Old World or the New." It published poetry, essays, fiction and other literary offerings. The first issue of the new periodical was published in January of 1828. Hale conceived of the magazine as promoting "female improvement" (she would later come to dislike use of the term "female" in such contexts). Hale used her column, "The Lady's Mentor," to push that cause. She also wanted to promote a new American literature, so rather than publishing, as many periodicals of the time did, primarily reprints of British authors, she solicited and published work from American writers. She wrote a considerable portion of each issue, about half, including essays and poems. Contributors included Lydia Maria Child, Lydia Sigourney and Sarah Whitman. In the first issues, Hale even wrote some of the letters to the magazine, thinly disguising her identity. Sarah Josepha Hale, in accord with her pro-American and anti-Europe stance, also favored a simpler American style of dress over showy European fashions, and refused to illustrate the latter in her magazine. When she was unable to win many converts to her standards, she stopped printing fashion illustrations in the magazine. Sarah Josepha Hale's ideology was part of what has been called the "separate spheres" which regarded the public and political sphere as being man's natural place and the home as being woman's natural place. Within this conception, Hale used nearly every issue of Ladies' Magazine to promote the idea of expanding women's education and knowledge to the fullest extent possible. But she opposed such political involvement as voting, believing that women's influence in the public sphere was through their husbands' actions, including at the polling place. During her time with Ladies' Magazine -- which she renamed American Ladies' Magazine when she discovered there was a British publication with the same name -- Sarah Josepha Hale became involved in other causes. She helped organize women's clubs to raise money to complete the Bunker Hill monument, proudly pointing out that the women were able to raise what the men were unable to. She also helped found the Seaman's Aid Society, an organization to support women and children whose husbands and fathers were lost at sea. She also published books of poems and prose. Promoting the idea of music for children, she published a book of her poems appropriate to be sung, including "Mary's Lamb," known today as "Mary Had a Little Lamb." This poem (and others from that book) was reprinted in many other publications in the years that followed, usually without attribution. "Mary Had a Little Lamb" appeared (without credit) in McGuffey's Reader, where many American children encountered it. Many of her later poems were similarly lifted without credit, including others included in McGuffey's volumes. The popularity of her first book of poems led to another in 1841. Lydia Maria Child had been the editor of a children's magazine, Juvenile Miscellany, from 1826. Child gave up her editorship in 1834 to a "friend," who was Sarah Josepha Hale. Hale edited the magazine without credit until 1835, and continued as editor until the next spring when the magazine folded. In 1837, with the American Ladies' Magazine perhaps in financial trouble, Louis A. Godey purchased it, merging it with his own magazine, Lady's Book, and making Sarah Josepha Hale the literary editor. Hale remained in Boston until 1841, when her youngest son graduated from Harvard. Having succeeded in having her children educated, she the nmoved to Philadelphia where the magazine was located. Hale became identified for the rest of her life with the magazine, which was renamed Godey's Lady's Book. Godey himself was a talented promoter and advertiser; Hale's editorship provided a sense of feminine gentility and morality to the venture. Sarah Josepha Hale continued, as she had with her previous editorship, to write prolifically to the magazine. Her goal was still to improve "the moral and intellectual excellence" of women. She still included mostly original material rather than reprints from elsewhere, especially Europe, as other magazines of the time tended to do. By paying authors well, Hale helped contribute to making writing a viable profession. There were some changes from Hale's previous editorship. Godey opposed any writing about partisan political issues or sectarian religious ideas, though a general religious sensibility was an important part of the magazine's image. Godey fired an assistant editor at Godey's Lady's Book for writing, in another magazine, against slavery. Godey also insisted on the inclusion of lithographed fashion illustrations (often hand-colored), for which the magazine was noted, though Hale opposed including such images. Hale did write on fashion; in 1852 she introduced the word "lingerie" as a euphemism for undergarments, in writing about what was appropriate for American women to wear. Images featuring Christmas trees helped bring that custom into the average middle-class American home. Women writers in Godey's included Lydia Sigourney, Elizabeth Ellet, and Carline Lee Hentz. Besides many women writers, Godey's published, under Hale's editorship, such male authors as Edgar Allen Poe, Nathaniel Hawthorne, Washington Irving, and Oliver Wendell Holmes. In 1840, Lydia Sigourney traveled to London for Queen Victoria's wedding to report on it; the Queen's white wedding dress became a wedding standard in part because of the reporting in Godey's. Hale focused after time mainly on two departments of the magazine, the "Literary Notices" and the "Editors' Table," where she expounded on the moral role and influence of women, women's duties and even superiority, and the importance of women's education. She also promoted expansion of work possibilities for women, including in the medical field -- she was a supporter of Elizabeth Blackwell and her medical training and practice. Hale also supported married women's property rights. By 1861, the publication had 61,000 subscribers, the largest such magazine in the country. In 1865, circulation was 150,000. Slavery: While Sarah Josepha Hale opposed slavery, she did not support the abolitionists. In 1852, after Harriet Beecher Stowe's Uncle Tom's Cabin became popular, she republished her book Northwood as Life North and South: showing the True Character of Both, with a new preface supporting the Union. She was skeptical of complete emancipation, because she did not expect that whites would ever treat the former slaves fairly, and in 1853 published Liberia, which proposed repatriation of slaves to Africa. Suffrage: Sarah Josepha Hale did not support women's suffrage, as she believed that voting was in the public, or male, sphere. She endorsed "secret, silence influence of women" instead. Education for women: Her support for women's education was an influence on the founding of Vassar College, and has been credited with getting women on the faculty. Hale was close to Emma Willard and supported Willard's Troy Female Seminary. She advocated women being trained as teachers in specialty schools of higher education, called normal schools. She supported physical education as part of women's education, countering those who thought women too delicate for physical education. Working women: she came to believe in and advocate for women's ability to enter the work force and be paid. Children's education: a friend of Elizabeth Palmer Peabody, Hale established an Infant's School, or kindergarten, to include her youngest son. She remained interested in the kindergarten movement. Fund-raising projects: She supported the Bunker Hill Monument and the restoration of Mount Vernon through fund-raising and organizing efforts. Thanksgiving: Sarah Josepha Hale promoted the idea of establishing a national Thanksgiving holiday; after her efforts convinced President Lincoln to declare such a holiday, she continued to promote the inclusion of Thanksgiving as a distinctive and unifying national cultural event by sharing recipes for turkey, cranberries, potatoes, oysters and more, and even promoted "proper" attire for a family Thanksgiving. National unity: Thanksgiving was among the ways that Sarah Josepha Hale promoted peace and unity, even before the Civil War, when, despite the ban on partisan politics in Godey's Lady's Book, she published poetry showing the awful effects on children and women of war. She came to dislike the term "female" used for women, "an animal term for gender," saying "Females, indeed! They might have been sheep!" She persuaded Matthew Vassar and the New York State Legislature to change the name of Vassar from Vassar female College to Vassar College. Writing of expanding rights and the moral authority of women, she also came to write that men were evil and women were good, by nature, with women's mission to bring that goodness to men. Sarah Josepha Hale continued to publish prolifically beyond the magazine. She published poetry of her own, and edited poetry anthologies. In 1837 and 1850, she published poetry anthologies that she edited, including poems by American and British women. An 1850 quotations collection was 600 pages long. Some of her books, especially in the 1830s through 1850s, were published as gift books, an increasingly popular holiday custom. She also published cookbooks and household advice books. Her most popular book was Flora's Interpreter, first published in 1832, a kind of gift book featuring flower illustrations and poetry. Fourteen editions followed, through 1848, then it was given a new title and three more editions through 1860. The book Sarah Josepha Hale herself said was the most important she wrote was a 900-page book of over 1500 brief biographies of historical women, Women's Record: Sketches of Distinguished Women. She published this first in 1853, and revised it several times. Sarah's daughter Josepha ran a girls' school in Philadelphia from 1857 until she died in 1863. In her last years, Hale had to fight against charges that she had plagiarized the "Mary's Lamb" poem. The last serious charge came two years after her death, in 1879; a letter Sarah Josepha Hale sent to her daughter about her authorship, written just days before she died, helped to clarify her authorship. While not all agree, most scholars accept her authorship of that well-known poem. Sarah Josepha Hale retired in December 1877, at age 89, with a final article in Godey's Lady's Book to honor her 50 years as an editor of the magazine. Thomas Edison, also in 1877, recorded the speech on phonograph, using Hale's poem, "Mary's Lamb." She continued to live in Philadelphia, dying less than two years later at her home there. She is buried in Laurel Hill Cemetery, Philadelphia. The magazine continued until 1898 under new ownership, but never with the success it had had under Godey's and Hale's partnership.